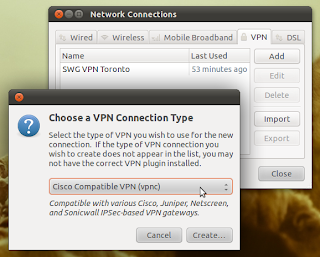 On Ubuntu, you don't need to install the Cisco VPN Client: NetworkManager includes support for Cisco IPSec VPNs. This 3 steps article will walk you through a successful installation and configuration of your VPN client. If you encounter any issues, or need more details, make good use of the comments form at the end. First of all, make sure you have your authentication details at hand! Ubuntu ships by default with the plugin for the Point-to-Point Tunneling Protocol (PPTP), but we need the plugin for the Cisco Compatible VPN (vpnc), that provides easy access to Cisco Concentrator based VPNs. Is your Ubuntu version 10.10 or older? Installing the Cisco VPN client on a kernel older than 2.6.38+, will result in compilation errors: the cisco_ipsec module crashes and the system is only of limited use. 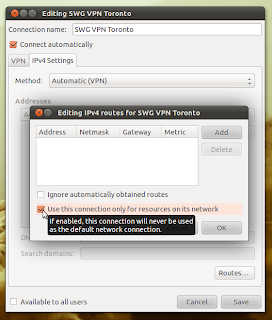 and follow the next steps for setting up your VPN. Find Network Connections in your Dash, and in the VPN tab select Import to choose your .pcf file, or Add if you want to manually enter your authentication details from Step 0.
unless you want all your traffic to be significantly slowed down. You might want to reboot your machine, and you're good to go. Give it a try! This is a great tutorial. Well written and well documented. I've just stumbled on it at Dzone. I have an Ubuntu sandbox at home that I am playing with. I'll try installing Cisco VPN on it using your instructions! I'll try this tomorrow, thanks! This it just now and it works! I did get the following error at first: The VPN Connection 'Test VPN' failed because there were no valid VPN secrets. Excellent. It works without problems. 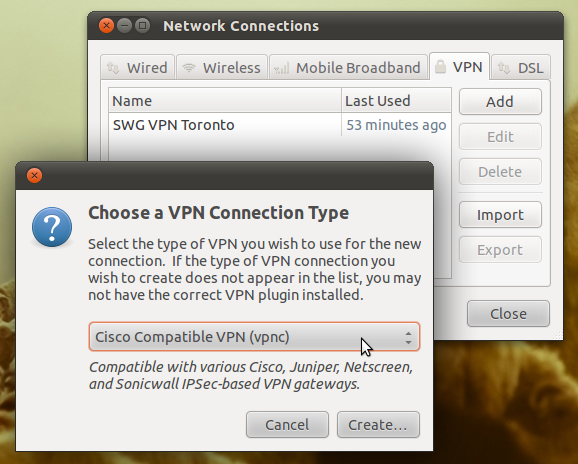 p.s: this is my 2nd day using Ubuntu and I needed this VPN client for work :) If I can get it to work, so can you! I am getting a popup asking me to "You need to authenticate to access the Virtual Private Network 'name of my work vpn'"
What exactly is it asking for? @Juan, could you give more details for the settings you use? thanks Marius Butuc for your guide. i have problem sama as jzuijlek : The VPN Connection 'Test VPN' failed because there were no valid VPN secrets. then i restart my ubuntu an try to connect. If my kernel is 2.6.38-8-generic will I need the patch?